I’m going to say from the outset “Do as I say, not as I do.” Why? I’m not renknowned for my patience. I like to make things happen quickly, both professionally and personally. Ask my wife – she must be VERY patient. 19 years in recruitment has taught me that I must have patience. If you rush you will miss something. Every day I have to try and instill that patience in others: Candidates who are searching for the right role or waiting for feedback. Clients who are looking for the perfect candidate. Members of my team who are dealing with the same things as me on a daily basis. Here’s the thing. 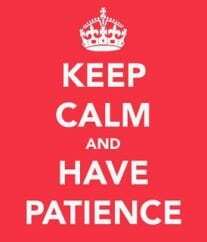 I believe that patience allows for calm, rational decisions to be made by everyone involved in a particular situation. Forcing things to happen can seem like desperation, and desperation is not something that candidates, clients, future employers, or anyone else for that matter, find attractive. It makes for bad decisions (see my earlier blog here on making bad decisions Indecision or bad decision?). So where is that fine balance between being patient and looking like you don’t really care? When does chasing someone become stalking? Should I call? Should I e-mail? Should I wait? Honestly, these are all very subjective but think about what else might be going on in the background. The fact that you are still waiting to hear something is probably no reflection on you at all. The decision makers that I deal with are not sitting around all day waiting for me to call. They have day jobs to do and recruitment is just a part of that. I’ve learned to accept that. Sales Directors don’t usually spend eight hours a day recruiting. As much as it may be a prioroty for them to fill their vacancies, other priorities tend to get in the way. Often my most important and productive calls happen out of hours. This evening is a perfect example: 14 calls since I left the office with a mix of candidates and clients that I needed to speak to. If you are working in any type of sales role you need to expect this and you need to accept it. I have a number of new clients that I’m working with at the moment and I know that most often I tend to speak to them before 8.30am or after 6.00pm. Does it bother me? No. It’s what I have always done and what I will continue to do. Clients and candidates who have known me for longer know that I will always try to take their call at any time. If I can’t I call them back. Do I chase them? Of course I do. Do I know when to stop? Usually. In my opinion, we are living in a society where people want instant gratification. Everyone wants an answer immediately but we know that’s not always possible. A little patience can go a long way to building the right kind of relationships.